Our instructors are all hand-picked from 100s of applicants and come from 4 countries. All have been certified by one or more of the four largest and oldest Pilates training programs in the United States, and are fluent in both French and English. The average experience level of Pilates instruction of our staff is 8+ years - and our five lead instructors have almost 100 years of professional experience in teaching exercise, dance and Pilates. They all attend regular seminars and workshops to keep up to date on learning and teaching the evolution of the Pilates Method. This page updates often, please stop by again! Touch photos for instructor bios. 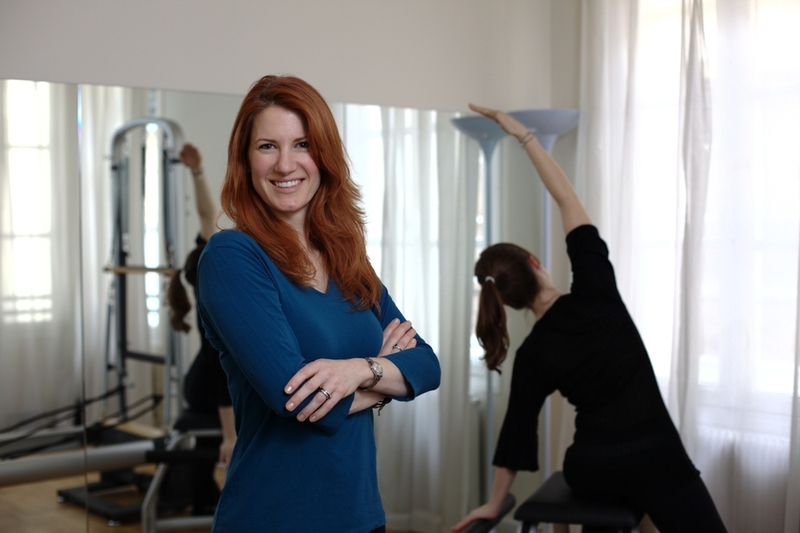 Erin is a former professional dancer who has been teaching Pilates for 13 years in 3 countries. She founded her own Pilates company in 2004, and created the "Pink Ribbon Pilates Program" - designed to help women recover from breast cancer surgery - at Morton Plant Hospital, as well as other programs for rehabilitating surgery patients and those recovering from back injuries with surgeons, chiropractors and physical therapists in NYC, Tampa and Paris. Erin is certified to train students and to certify Pilates Instruction professionals by The Physical Mind Institute in NYC: the world's first formal Pilates certification program. She also travels around the world for seminars and training workshops to keep up with the continuing evolution of the Pilates Method. She speaks fluent English and French. Joanne Bouis - Following a long successful career of performing and teaching dance in the UK and France, Joanne was first certified with Corebody Pilates and The Pilates Center Boulder in 2005, then went on to be certified with Peak Pilates. She felt it was a natural progression from dance to Pilates, and what better way to re-educate her body and help others! Since immersing herself in the world of Pilates, Jo has also trained in pre- and post-natal Pilates and X-tend barre which combines Pilates, Ballet and Cardio. She is passionate about, and committed to each of her client's individual needs and adapts her classes according to their goals. Jo is fluent in both English and French. Joel Leucht - For twenty-five years Joel toured the world as a professional contemporary dancer, based in the United States and France. He was certified by Peak Pilates and participates in numerous workshops to develop a deeper understanding of the Pilates Method. Joel has taught Pilates for the last nine years at several top studios in Paris. His thoughts on teaching Pilates: "I adapt to the needs and desires of the student and try to ensure a Pilates experience that is both pleasant and efficient." Joel is fluent in both French and English.